The perfect "al dente" bite in more than 35 varieties. Italians know the familiar Blue Box means quality, perfectly "al dente" pasta every time. That's why Barilla has been an Italian favorite for over 140 years, and continues to be the #1 pasta in Italy today. With more than 35 shapes in our line of traditional semolina pastas, you're sure to find the perfect pasta for any occasion. For tips and tricks on how to cook pasta, check out the Cooking Solutions FAQs. 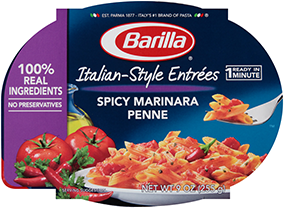 Barilla® Blue Box pasta is made with non-GMO ingredients. For more information, please read our position.